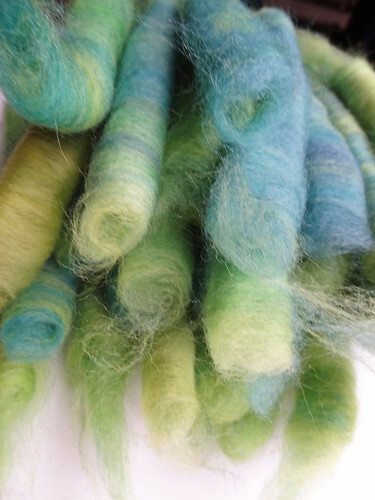 I have finally finished spinning up the first rolags I made on my birthday blending board. These rolags were scruffy and far too dense. I made around 10 rolags out of fibre weighing 120g. Rolags really should be more light and airy. These were more like very very fat punis! 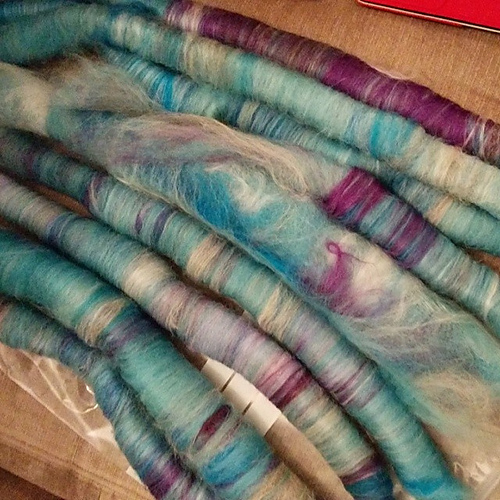 Despite the messiness of my rolags I really enjoyed spinning them. The blend was lovely, using light grey baby alpaca, purple bamboo, teal merino and white kid mohair from World of Wool, and teal Bluefaced Leicester (BFL) from Sara's Texture Crafts. I have no idea of the proportions of this fibre, I just wrote down the contents! I spun it on my Enid Ashcroft compact Tibetan spindle with an ebony shaft and thuja burl. It's a very short spindle and it required singles to be wound off fairly frequently. 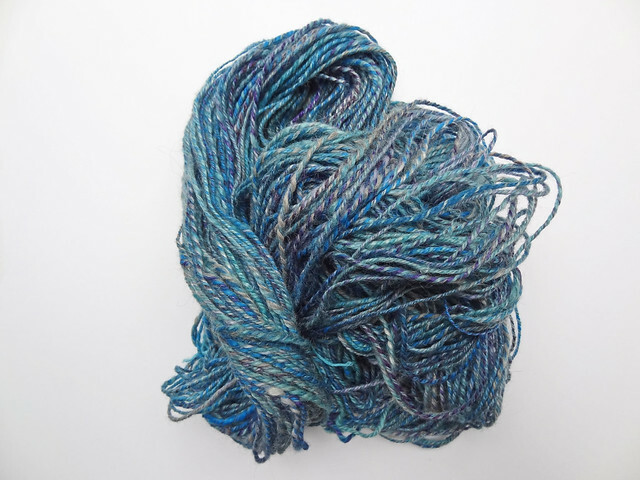 I plied the singles into a true 3-ply to try and even out the very wonky singles and I think it worked. Looking closely at the yarn, the thickness seems more uniform than I expected. 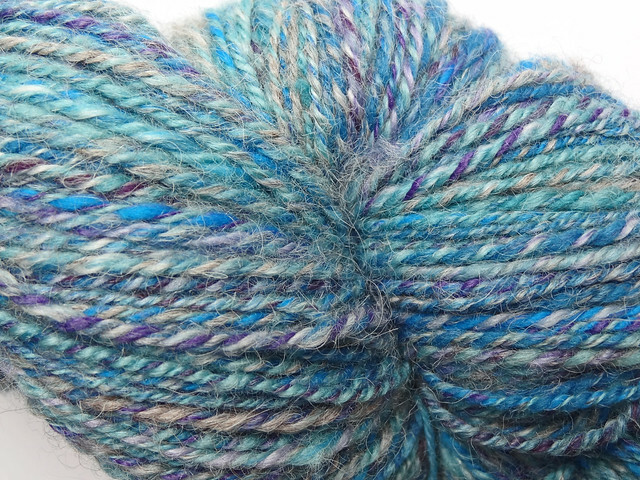 I got 189m/207yds of a DK/worsted weight yarn, that is fairly lofty and soft. I think it would make a pretty warm hat or set of mitts. I was surprised at how much I enjoyed spinning these rolags as they weren't very well constructed, but it wasn't a bad experience at all. I have plenty of "bits" of fibre left to play with in my "big bag o'fluff" so I know I'll be playing with it more often. I already decided to try and practice with a single braid of dyed fibre so I could get better at layering fibre and creating rolags from it. I used 100g of Babylonglegs (who sadly no longer dyes fibre) BFL roving that had been sat around for a long time and got quite compressed. Loosening the fibre and then applying it to the board broke up any sticky bits and created nice lofty rolags. With each pass, I only placed one layer of fibre on the board before carding it. I filled in any thin pieces and carded that in too. I made 3-4 rolags from each board I filled. I tore the long rolags in half lengthways to make it easier for storage. 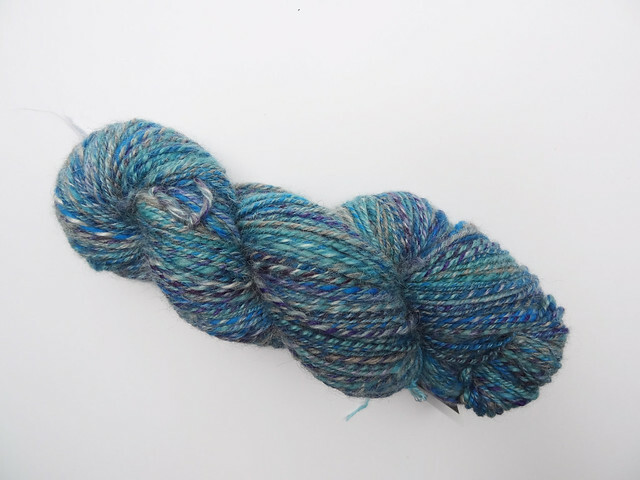 As you can see, I got a lot more rolags out of my 100g of fibre than I did from the 120g of the first batch I tried. I may have had to load the board more often, but I love how lofty these rolags are in comparison. It's much less physical to draft out thinner layers of fibre, which is a plus for someone like me. It might take longer, but I will hurt less at the end of it. 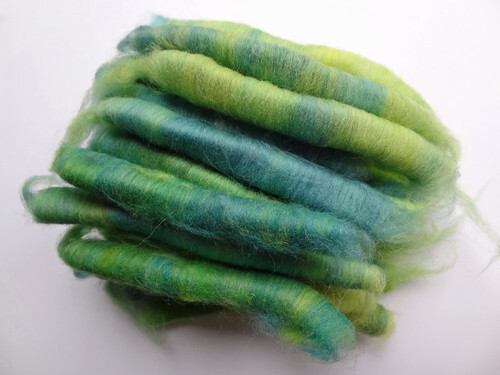 I think I will really enjoy spinning these rolags, and I'm itching to grab a spindle and have a go, but I already have two spinning projects on the go at the moment, so these will have to wait another week to be played with. If it works as well as I think it will, I may be employing this technique often, when I get some fibre I want to woollen spin.